Choose a plant that you are irresistibly drawn to. Don’t think too much. The plant will draw you to it. Prepare to draw. Look at plant. 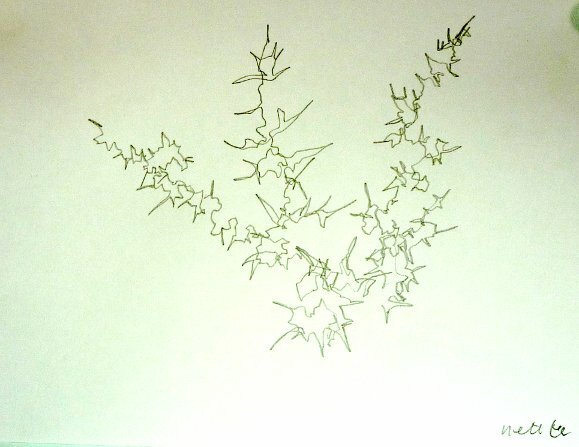 Don’t take your eyes off the plant and start drawing. Don’t look at what you’re drawing. Your conscious mind, which operates through vision, will only get in the way of the work of art you are creating. Try to fill the page by feeling your way round the edges of the paper with your other hand. This isn’t too important but something to experiment with. Do loads of drawings really quickly. Try gold pen on black paper, felt tip on white paper, wax crayon on black. You’ll be surprised at what you create. Glue your drawing onto card and dedicate to a friend. Pop in an envelope and send off right away. Speed is of the essence. Your friend needs to see your creative talent as soon as possible. And needs to know you are thinking of him or her as soon as possible. 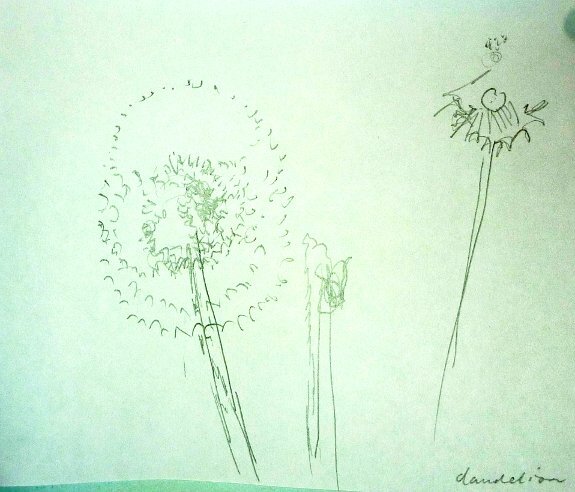 This is what Hamish drew and wrote – what a star! removes all expectation of what may happen. Friends of the Earth would like to invite you to join us for an evening of discussion withZayneb Al Shalafeh. Zayneb is an environmental justice activist currently visiting the UK from Palestine. She works to organise and support communities in Palestine, particularly on fair access to water, land and better agriculture. She will be sharing stories from her work with the organisationLifesource, which advocates forrights to access water for Palestinians. Lifesource does this through research, popular education and resistance with a special focus onwomen’s empowerment. So join us for an inspiring evening of discussion onmovement building and environmental justice. Find out what we can learn from Zayneb’s stories and how we can apply it to our activism in London and the UK. How can we offer solidarity to communities working on environmental justice issues in Palestine? Please emailcharlotte.chan@foe.co.uk to book your place. This one of the first chapters of the book Street Food. Photos are from our event on 3rd May. Hurray! the book is beginning to emerge! Dishes that are part of a ritual have a special resonance that we can slip into when we make it ourselves. 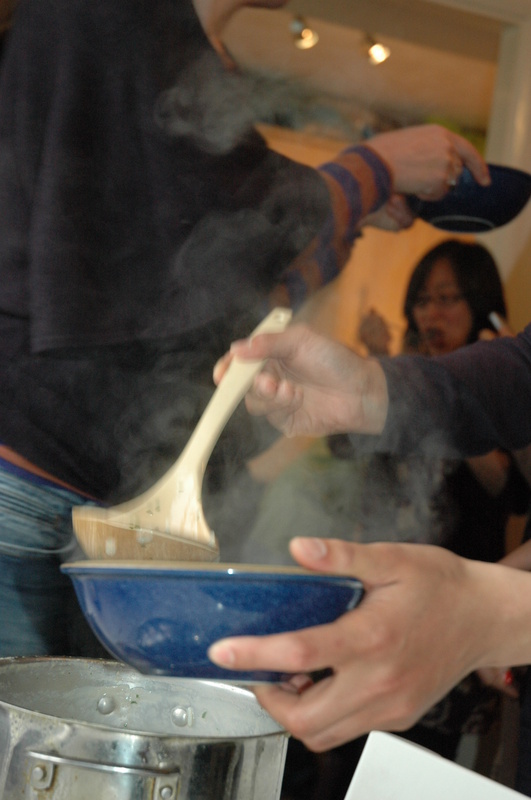 The Japanese dish Nanakusa-gayu or Seven herb porridge is made on the 7th January as a new year dish to bring in good health and prosperity for the coming year and also as a soothing broth after the new year festivities. Nanakusa-gayu is a type of congee, which is a type of rice porridge common to many Asian and Asian-influenced countries. It is a rice soup with additions of ginger, spring onion, chicken and herbs all common. In other Asian cultures, it is also called kanji (Tamil/Malayalam/Tulu), juk (Cantonese, Korean), cháo (Vietnamese), deythuk (Tibetan), chok (Thai), kayu (Japanese), lúgaw (Filipino), “Bubur” (Malay) or jaou (Bengali), zhou (粥) in Mandarin and even canja in Portuguese. All these words mean gruel or broth. 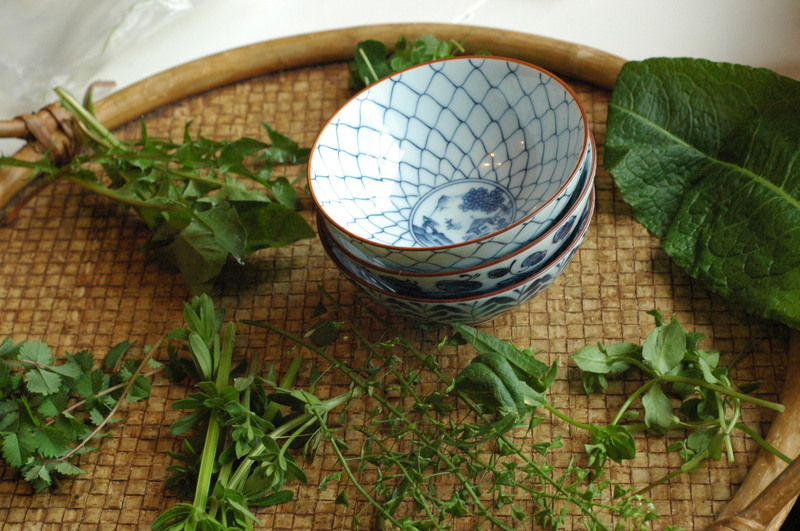 The wonderful thing about Nanakusa-gayu is that most of the traditional herbs – Japanese water dropwort, shepherd’s purse, cudweed, chickweed, nipplewort, turnip greens and radish greens – are available in the UK, although we have to substitute the water dropwort. The Japanese water dropwort (oenanthe javanica) isn’t toxic but our wild growing hemlock water dropwort (oenanthe crocata) is lethal. If you wanted to substitute with a plant of the same family, then try cow parsley (Anthriscus sylvestris). However, it’s very easy to confuse cow parsley with hemlock water dropwort so observe an easily confused plant for at least a year before you attempt to use it. And if you do use it, always do so paying close attention, with your full intention on picking safely. Don’t ever get blasé about your task. Play this game safely! With Invisible Food, we prefer to use what’s abundant and easily and effortlessly available and there’s definitely something of this spirit about the original dish, in which herbs are often substituted by what’s available at a dark and wintery time of year. 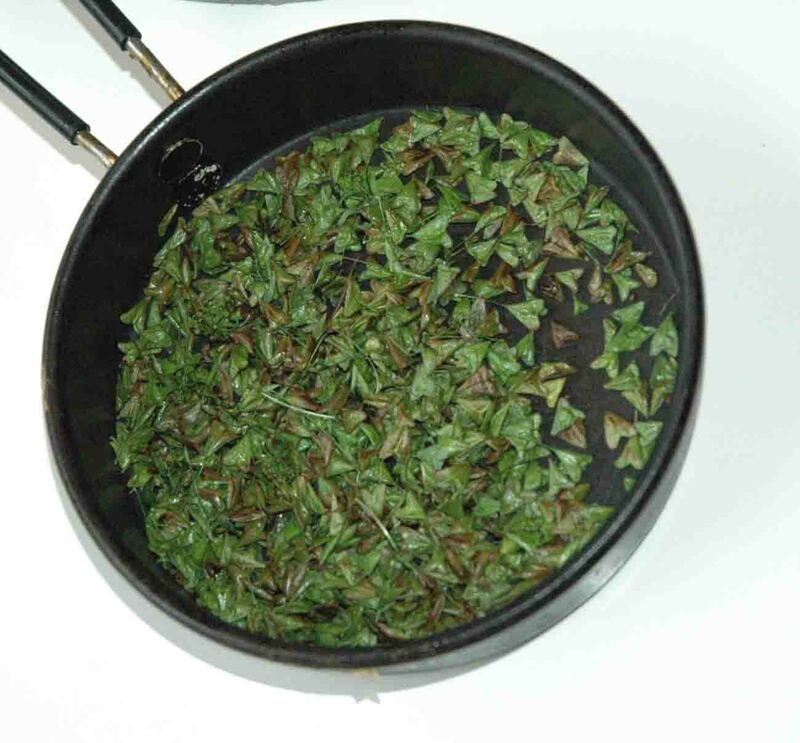 This dish was made with shepherd’s purse, chickweed, ladies bedstraw, dandelion, salad burnet, clover leaves, and to honour the use of the greens of a vegetable, dock leaf. Toasted shepherd’s purse seeds taste a bit like seaweed flakes! Add water and bring to the boil. Reduce the heat and simmer for 25 – 30 minutes until the rice is cooked. Add the herbs shortly before the rice is cooked. Take the shepherd’s purse seeds off the stem and lightly toast. Sprinkle a few shepherd’s purse seeds on each serving.